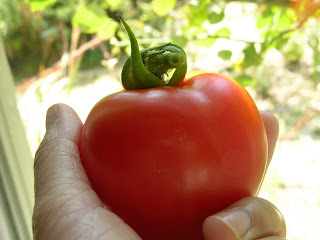 Our first garden tomato of the season, an Early Girl, was not so early. But totally perfect. Meet Reynaldo. 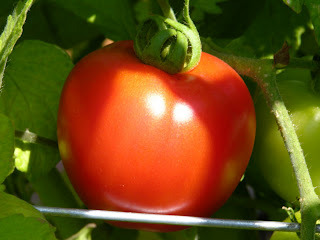 He was the biggest tomato of our 13 plants, and we've been waiting for him to turn nice and red for weeks. Finally, satisfaction. At least for us. Unfortunately for Renny, it was the end of the road. Reynaldo's last appearance before being invited to breakfast. Good work, our tomatoes are still green, green, green. you just need to threaten them. or annoy them like i did, by squeezing them every day and asking, "are you ready yet, are you ready??"